What Fins are Best to Buy? 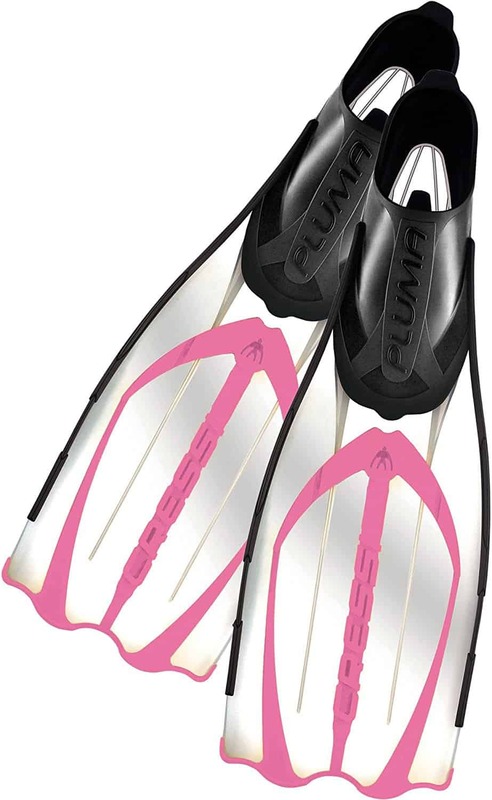 Scuba dive fins are an essential piece in the puzzle of getting all your dive gear. They are essential pieces of equipment whether you scuba dive, snorkel or free dive. For all three sports you need fins to propel yourself through the water. Fins make it easier and reduce the effort that is required to have your body being propelled through the water. Whether it’s on the surface when you snorkel or deep down into the depths when you scuba dive or free dive. Under water your legs do nearly all of the work to get you moving forward or down. The fins support the legs in being an extension that is optimized to need the least amount of muscle for the most amount of propulsion. There are some minor and some major differences between the different fins you can buy. Some of them are due to the different sports they target while others are regarding to a completely different design of the fins. This guide explains all the different fin options to you. 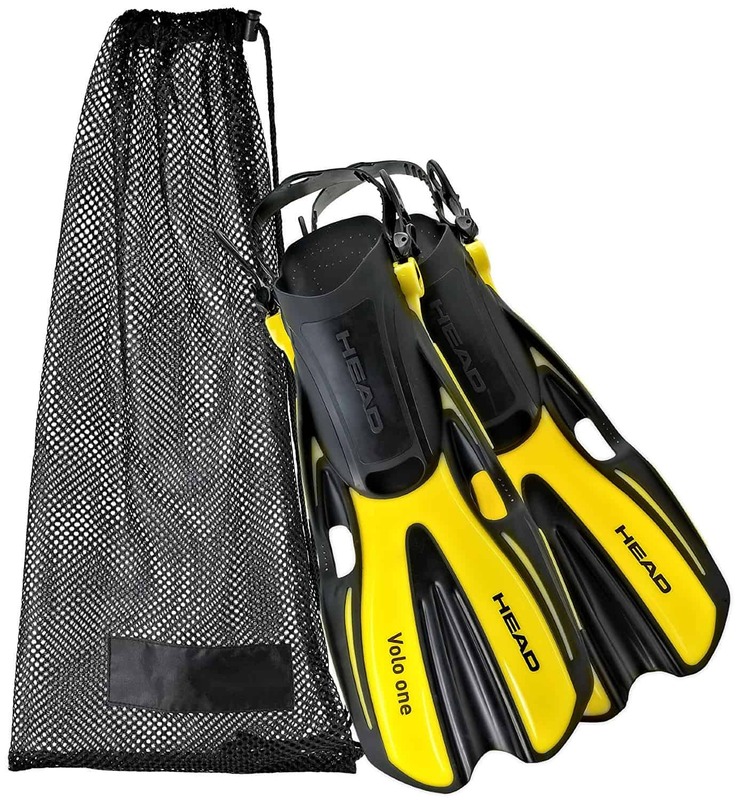 The goal is for you to be able to decide on the best fins for your kind of dive or snorkel sport. We’re looking at the overall differences by sport, by foot pocket design and by fin design. You want to look at different kinds of fins depending on your kind of sport, whether it’s snorkeling, scuba or free diving. These different sports have small but distinctive different requirements for the fins you want to use. During snorkeling you will not or not often submerge. As you don’t need the added energy to go deep down under water, you will also not need a set of long fins. F﻿﻿ins for sno﻿﻿rkeling are shorter and somewhat simpler than scuba or free-dive fins. Not going under water requires less energy. Having long (or simply wrong) fins will make you feel like you are fighting your fins. If that is the case then try to go for shorter and lighter fins. They will be more comfortable and precise when aiding you during your snorkel excursions. When you scuba dive you need more power coming from your scuba fin﻿s. You need the additional power to be able to get down under water quick and with the least amount of effort. Fins for scuba diving are usually around the same length as snorkel fins. They might be stiffer or have a slightly different design. Some scuba fins are a little longer than fins for snorkeling. Scuba fins do overall require more leg strength to effectively produce a powerful kick under water. Free diving requires a lot more propulsion than scuba diving or snorkeling. During free diving you try to dive very deep without using any air supply except for the air in your lungs. This requires to get down and back up as fast as possible. 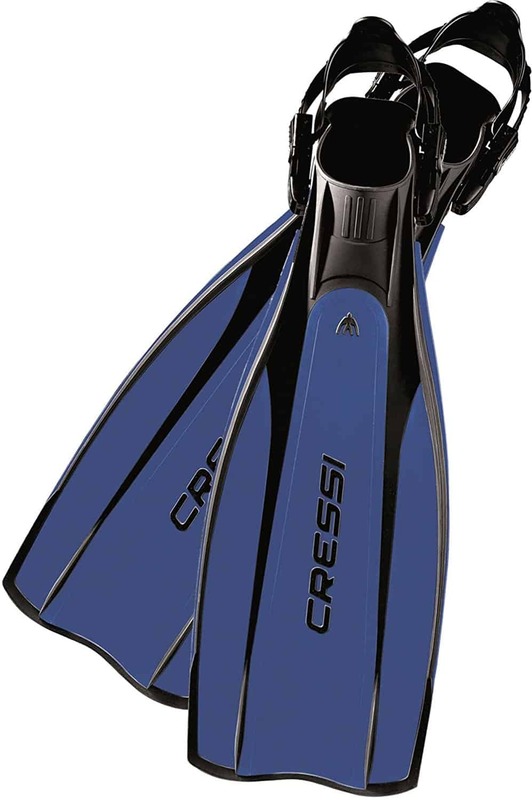 Therefore, free diving fins are usually longer to provide the strongest possible propulsion for each kick. This significantly reduces the amount of kicks required during descent or ascent and therefore conserves oxygen. Longer fins help achieve this goal but also do require that your legs are strong enough to generate such powerful kicks. 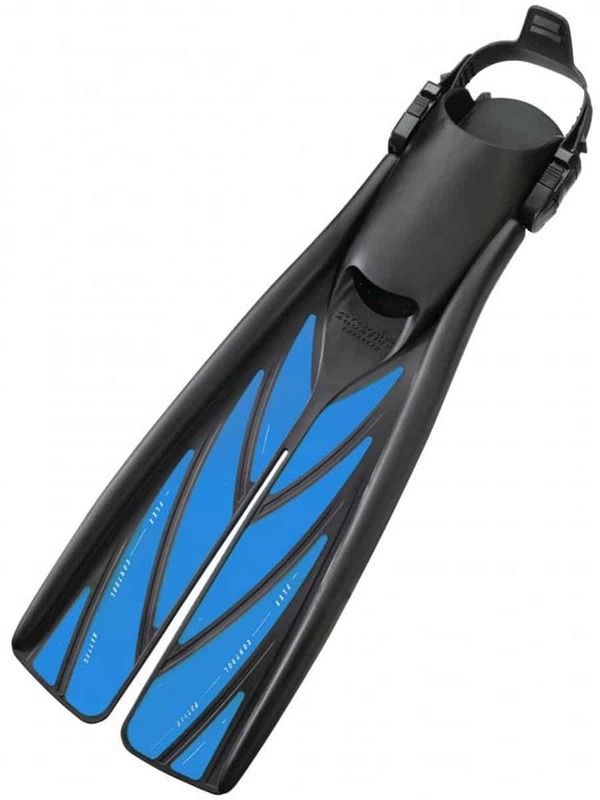 You can find two different types of foot pockets when looking at fins for snorkeling or diving. First, there’s the full-foot design. The other type is the open heel fin. Both are very different in their design and in their use for specific environments and conditions. Looking at full foot fins you will see that they are basically shoes with an attached fin. You slide into them like you slide into a shoe. The problem is that if you’re not having a great fit then there’s nothing else you could adjust to make them fit better. When they fit correctly then they are the most comfortable type you can get. They are best used in warm waters and for snorkeling. You will have an easy time to put them on or to get out of them. You also won’t need to wear booties. These kinds are the most used for scuba diving. Instead of a heel like in a shoe you have a strap around the heel to keep your foot in place. 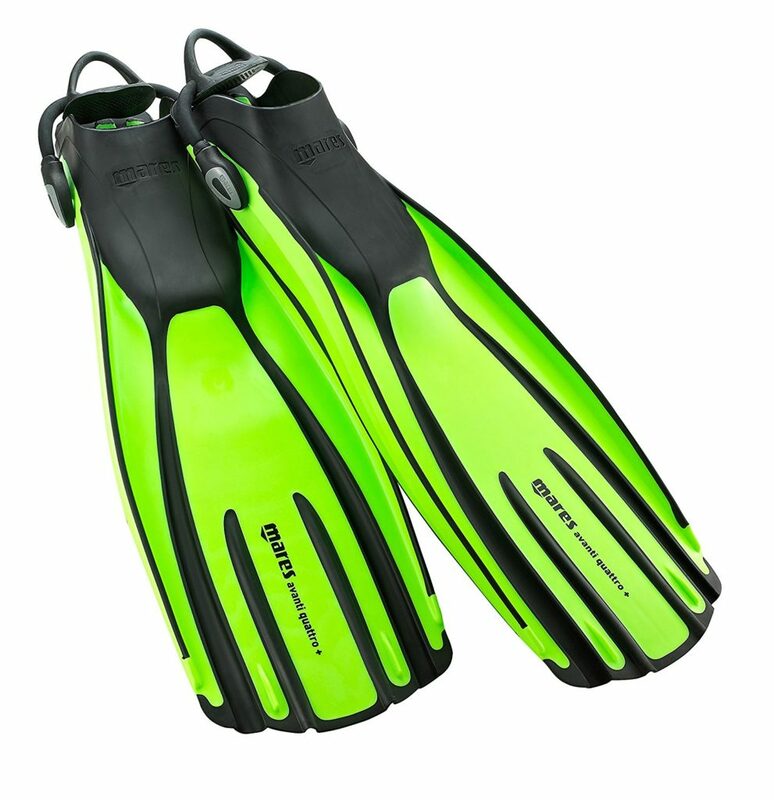 Even if not diving in really cold water you will usually wear open heel fins with booties. That means that you have to measure for fit while wearing your booties! Open heel fins have the great advantage that you usually can replace the straps if they break. Full foot fins have to be thrown away if the heel breaks as there’s nothing that can be replaced. Being able to replace the straps is important when you consider that many of these scuba fins end up being quite expensive. Most open heel fins have larger blades compared to full foot fins. The blade is often also stiffer. The combination of these two factors results in more thrust with each kick. The larger blade and with that the larger fin makes it harder to travel though. They don’t fit as easily into your suitcase anymore and they usually also weigh more. If you travel a lot you want to consider both weight and length and possibly get a shorter and also lighter fin. There are typically two different styles of blades to consider. You can either get split fins or paddle fins. Paddle fins are the most common ones and were the first type of fins used for scuba diving. Split fins are a relatively new invention and are seen more and more often. Paddle fins are usually the most affordable kind of fin. They’ve been around for decades and are a proven design. The stiffness of the blade depends on the manufacturer but mostly all of these kinds of fins are easy to use and provide a controllable kick. Split fins are designed to require less effort when kicking while producing the same thrust as a paddle fin. They are a great choice if you have ankle problems or you can’t generate a powerful kick. They are best used in calm waters. In heavy currents they get harder to use. Otherwise they can reduce your air consumption due to less effort to produce a kick. You can check out our Split Fins vs. Regular Fins article going into the differences and backgrounds behind both of these fin styles. There are sub-types for each of these two main types. One of those is the channel blade fin. These fins have very stiff outside rails and the center area is flexible. They are probably not best suited for the beginner as they require a good understanding of your own kick strength. They can also be on the expensive side so you want to make sure you dive a lot in order to get your money’s worth. Another sub type of fins are the ones with long blades for free diving or spearfishing. The only difference to paddle fins is that the blades are longer and provide more thrust. The forward propulsion is generated through the blade of the fin. There are a variety of different designs and shapes of blades that are all having the same goal: provide as much propulsion and thrust under water as possible with the least amount of energy spent. You can find numerous designs of blades. Some will have rails on the side for higher stiffness, others will have stiffer and softer areas throughout. You can even find blades with vents to reduce drag. You often also can see ribs on the blades which increase the firmness. Shapes range from futuristic shapes coming out of computer programs to designs that resemble nature. Split fins have completely different shapes of the blades compared to paddle fins. While all this can be confusing, be aware that as a beginner or recreational diver, you will not necessarily get much benefit out of using the latest and greatest with more or less ribs or rails. Many of these designs work very well in some situations but then on the other hand have disadvantages in other places. The stiffness of the blade is a rather subjective matter. If you are a strong guy with a strong kick then you will definitely prefer and need a stiffer blade. However, a smaller diver with less strength in the kick will need a less stiff blade. That is not to say that this diver couldn’t deal with a stiff blade. The stiffer blade runs the risk though that it wears a beginner or smaller person out. In the end for the beginner or recreational diver it comes down to getting a somewhat less stiff blade. Most of the standard fins you can find online will suffice. 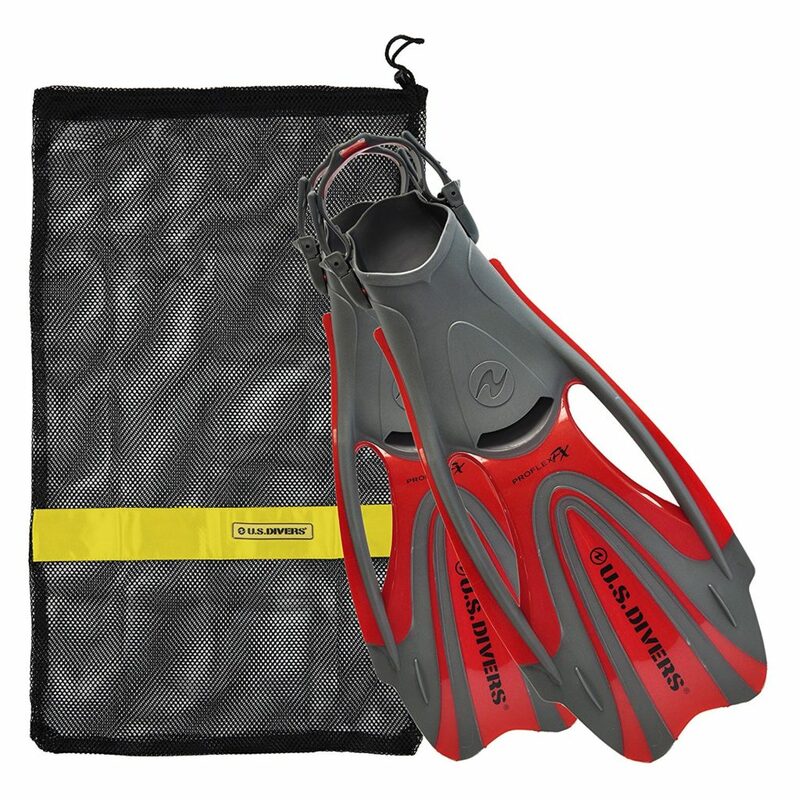 You won’t run into any issues with fins from any of the best dive gear manufacturers. There are plenty of choices when it comes to fins. If you are a recreational diver or just beginning with the sport then you actually might have the least issues finding fins for yourself. Stick with the readily available and highly rated fins and you will have many enjoyable dives ahead of you! No matter what kind of fins you get, make sure that you mark them with a waterproof pen. You might be surprised how many divers will have the same fins as you do when you go onto a dive boat. And you definitely want to be able to end up with your fins again. If you get open heel fins then make sure that you also buy replacement straps. It’s a good idea to have them with you and available when you dive as you never know when your straps might break. As luck has it, they will usually rip at the worst time and you’ll be glad that you can instantly replace them! 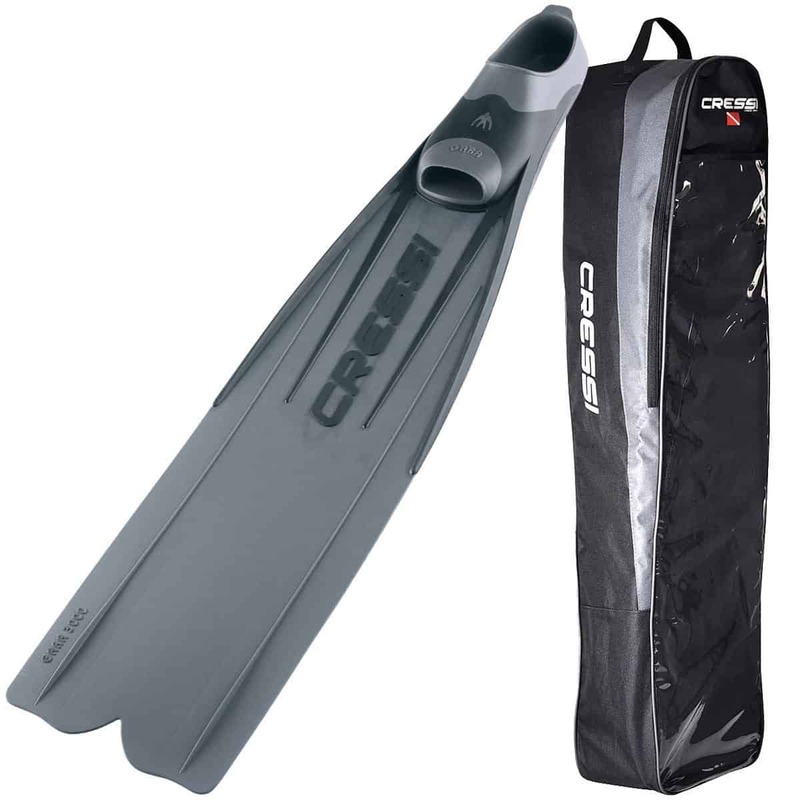 Select highly rated brand name fins that you can get online and you should end up being fine. We would suggest that you pick open heeled fins and if you just start with the sport or only dive once in a while then stick to blade fins. Split fins are great but do require some more experience.